A look at Ohio DNR reports over time offers some insight worth noting. Below I've taken report data from each of the last 13 months and displayed the data on a graph. 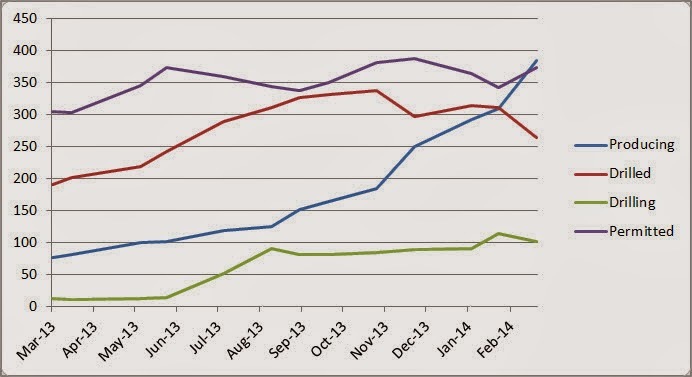 Drilling activity is far above what is was the first seven months of last year and crossed 100 wells classified as "drilling" in February of 2014. Wells classified as "producing" are showing the steepest climb, believed to be the result of both rising natural gas prices and infrastructure improvements as noted in earlier posts and widely reported by the media in general. There is also a steep reduction in wells classified as "drilled" and waiting to come online, perhaps indicating that wells are more quickly moving into production after they are drilled now that the situation for producers is more favorable. The backlog of wells classified as "permitted" is holding relatively steady, indicating that there is a sufficient backlog to sustain desired drilling activity. The relatively high level of drilling activity should mean that permitting will need to be maintained at a high rate to match. Permit activity looks poised to take off after a brief pause in December 2013 and January 2014, a weather related phenomena perhaps. Natural gas prices and the need to keep wells funneling into the system (to drill and produce) appears to have caused an upturn in February. One month does not make a trend, though everything seems to point to increased activity all around. 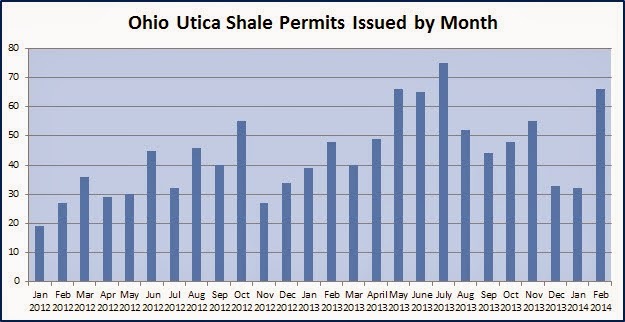 We typically see an increase in permitting activity as we move out of holiday and winter months as well. All systems appear to be "go" for the Utica Shale.